This is a favorite tale of mine, told only to a very close friend who needed to hear it at that time. I hope you like it too. Once upon a time, in a land far away, there lived a king with a heart as cold as the Northern wind. He was not a tyrant to his subjects, neither a violent man to his family. He simply did not find beauty or joy worthy of celebrating. On a Saturday, at sunset, our king saw the moon shimmering over the horizon. He felt a spark of want in his heart and decided to take the celestial body for himself. Calling forth his most trusted knight, the ruler gave him the quest of retrieving the silver disk from the sky. As a faithful servant, the armored man took on the long journey to reach the moon on foot with a cheerful disposition. The knight sung as loud as he could and ran as fast as he could after the celestial orb. It took all his strength to stay at the same distance with it for more than a few moments. It took all his physical form to get closer to the moon and then, after wishing the best for his king, he gave his very soul to reach his target and pushed it towards the castle. The king saw the moon hover over his home, proudly glowing with a brilliant silvery light. It hummed a song that only the kind would recognize as the one sung by the loyal knight. 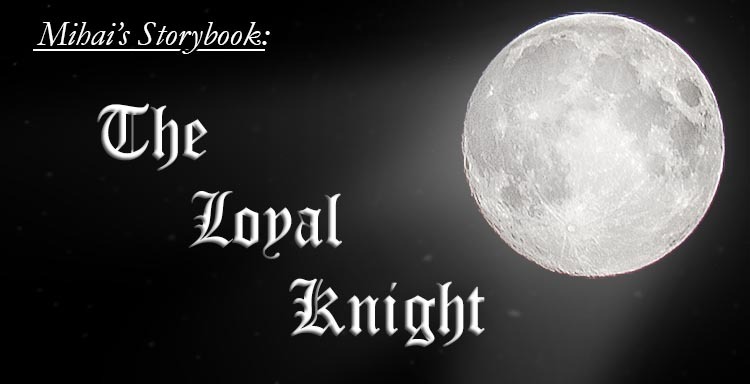 His heart was touched by the loyalty and determination the knight had. He cried, for it was his arrogance that made that brave soul offer himself to fulfill his master’s order. The tears of the king rose to the heavens and became the stars we now look upon today. And also, if we ever feel like singing to the moon, it will be in memory to the loyal knight. For the one who touched not only the celestial body of the night, but the untouchable heart of the king.